Have you come across this little gem then? Saw that once in the Library. Yes, P'ter. I actually got it for Christmas a few years ago. I loved it. There are cats in it! Thanks, folks, for the birthday greeting. It's coming up tomorrow. Just finished reading the story of Dewey Readmore Books, the library cat at the Spencer, Ohio library. Wonderful story! I'd rather barque up the wrong tree than tree up the wrong barque. Which apparently translates as "I would rather be stuck up a fruit tree than be a malefactor caught in incriminating circumstances." Last edited by P'ter; Mar 24 2009 at 03:28 AM. That was a sweet book. It made me cry harder maybe than most people since on August 11 I lost my beautiful Kittibits, who looked a great deal like Dewey and died in a very similar fashion. So I was sort of gutted all over again. My Italian cat lady friend says "ciao miao" a lot. I'm reading a cool one now about 100 Cats Who Changed the World. Some good cat facts in there. 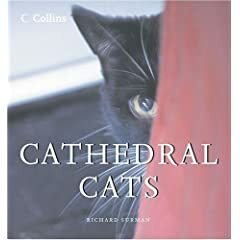 I take it that it doesn't include the story that one of the Mediaeval Popes who decided that cats belonged to Satan, so he banned them in a Papal Bull. Lack of cats = lots more rats = Black Death. Ufffs, P'ter, what a series of events to sweep through Europe. I did not know that it was due to a pope's decision. Is it really true?? It wasn't the only factor of course. A series of about three very cold wet years with rotten/no harvests reduced the resistance of the peasantry already 'living' below subsistance level. But given a more reasonable feline population there wouldn't have been quite so many rodents to act as the plague vector. The middle ages were not kind to cats--both Christians and Pagans burned them for various reasons and it's just plain heartbreaking to read about. The current pope is apparently a cat fan. I have found out recently that the Egyptians, who were supposed to have venerated cats and mummified them, were actually selling to the market! Apparently there was a vogue for mummified cats, and these bozos were mummifying kittens, going out and killing cats to keep a stock of them, and in the end mummifying darn near anything. Some of the 'cat' mummies have been x-rayed and found to contain frog bones! Makes you wish you could go back in time, yell 'Stop that!' at the folks, and rescue all the cats... though that'd be awfully costly in kitty litter! Oh yes indeed. And the supposed Egyptian veneration of cats wasn't very humane either. I saw a documentary recently, and all mummified cats they x-rayed had broken necks, e.g. they were sacrificial victims for the cult of Bastet. Yeah, I heard about that. Shame on them. But is it any worse then 'worshipping' the humans sacrificed to the great god Hollywood? Usually those people line themselves up to be sacrificed voluntarily. The poor cats had no choice. Hmm, that what Reggie sound like at night! I am still not up to full power. The cats do "tell" that, I was napping earlier and I had both of them. I hope to be able to read/listen to "Barque Cats", when the group come out! I hope you will too. There will be only two unless they sell really well and while the first one is done, the second one has just begun. Appreciate your support Ginny Star. I can not wait for them to come out. I need something NEW to read. So does Kibbie. I am getting very tired of Warrior Cat stuff. You should hear what she want to name any new cat we get. Stormfur, whitepaw, brambleclaws ect... UGG. I thought you were going to write as many as possible. I read somewhere else that you 'Kneeded' the money? Uh--P'ter, there is a connection between the money that we "kneed" (or is it knead?) and how many the publisher will buy. If they don't buy them, no money in writing them. And if they don't sell well (by which I mean new copies--at least paperbacks) the publisher doesn't care how many people actually read them as used books or from the library--the sales numbers don't support them buying more. It's all pretty brutal and with the current economic situation, it's become worse. For instance, for those of you in Great Britain, you'll probably have to order online because the British publisher that's bought every one of our other collabs passed on Barque Cats 1--not because it isn't a good book, because it is--but just because of the sales figures. I talked with Del Rey yesterday and after much discussion they are keeping the title of the first Barque Cat novel as "Catalyst" subtitle "A Tale of the Barque Cats." P'ter, I didn't know you worked for Del Rey! One moment the thread is derailed by cats, the next I discover Eann has appeared and has answered all our questions. Eann: I wouldn't mind working for/with Del Ray. Jumps for joy...Barque Cats! yippee! Very happy this makes me. Glad to hear it, Gwina. I’ve only read a few sentences myself, because I’m been very busy since graduating college with finding an apartment in Fredonia where I’ll be heading for graduate school. From what I’ve read so far the new book series looks very exciting!! I've read it. And it does sound exciting. I'm hoping the whole book lives up to the promise of the excerpt. I found a lovely little cat book today (I've already e-mailed this to Eann). It's called "100 Ways for a Cat to Find its Inner Kitten" by Celia Haddon. She's written about 8 others, inluding "100 Ways for a Cat to Train its Human". My friends, I am not sure how much of what was at the end of Deluge will actually appear in Barque Cats. It went through three rather hairy edits for some strange reason and we rewrote a lot of it. So I hope the bits you like remained.